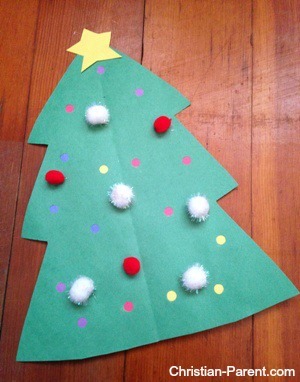 December 7, 2014 0 comments on "Christmas Tree Craft for Kids"
On the green construction paper draw the outline of a Christmas tree and cut it out. You can find a template of a tree here. Fold the tree in half lengthwise and use the hole punch to punch holes all over the tree. Cut out small squares of different colors of construction paper. Don’t forget to make a star for the top of the tree. Have your child glue the small squares of paper on the BACK of the tree, covering each hole with a square of colored paper. When you turn the tree to the front side, it will look like the tree is covered with tiny lights. If you want to hang the tree in a window, use tissue paper instead of construction paper for the “lights” and the light will show through the holes when you hang it in the window.